Kate Swann could be forgiven for thumbing through the self-help book section in one of her struggling stores. Having presided over one of the largest annual losses in WH Smith's long history, the task of restoring a household name to its former glory must seem more daunting than ever. However, investors - who welcomed the 39-year-old's appointment last year as a breath of fresh air - still hope that Ms Swann can put the ailing retailer back on its feet again. A £135m loss is not the start that any chief executive - particularly one who has been in the job less than a year and is new to running a publicly listed company - would want. However, investors acknowledge the scale of the problems facing the 212-year-old company and seem prepared to give her some time to tackle them. Although WH Smith was still making respectable profits when Ms Swann took the helm last year, its core retail business was steadily losing market share and many of its shops were stuck in a timewarp. Ms Swann's track record for injecting new life into flagging retail brands should give some confidence to worried shareholders and disillusioned customers. 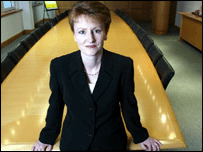 A marketeer by profession, Ms Swann was marketing director of Homebase before she was promoted to become the DIY chain's chief executive in 1999. Under Ms Swann's leadership, owners Sainsbury invested heavily in new formats in an effort to compete with the bigger and more aggressive B&Q. By the time Sainsbury sold Homebase to a venture capital firm for about £1bn at the end of 2000, her reputation had been enhanced. Ms Swann was then headhunted to become managing director of catalogue retailer Argos, where she oversaw two years of record profits. Ms Swann's actions since she took the top job at WH Smith last November have won her support. She has disposed of the retailer's overseas businesses and sold the successful but strategically peripheral publishing firm Hodder Headline. She also showed that she would not shirk from tough decisions by cutting 270 jobs at the firm's head office. However, amid the distraction of inevitable takeover speculation, it is on the shop floor that Ms Swann really needs to work some magic. She has identified weaknesses in the company's set-up and set about improving them. Stock availability, customer service and product range are all being gradually overhauled. However, it remains to be seen whether she can find a compelling case for WH Smith to retain a place in shoppers' affections and in their spending habits.